PDF is the most popular type of document format that has used in technical areas, schematics, white paper, brochures and a whole lot of documents to numerous to mention. Unfortunately, some PDF documents may need to be edited to get to the standard required. Even though, there are many ways to edit PDFs to get what you want. For example, it is possible to edit PDF text online with numerous online solutions, however, the disadvantages of using this method outweigh its advantages. 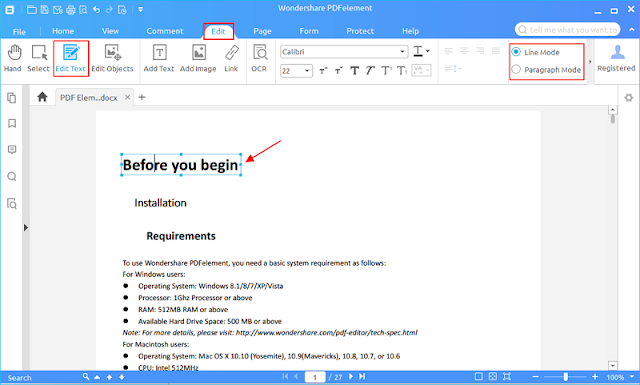 There is a reliable way of editing PDF files and that is by using Wondershare PDFelement. The PDFelement is lightweight by design but surprisingly it is a powerful PDF editor. Even though Adobe seems to be the benchmark of PDF editors, the PDFelement can do all Adobe can do and even better, thus, it is considered to be the number 1 alternative to Adobe. Besides, it costs less when compared to other PDF editors. For example, you just need to part with $89.95 for a PDF Professional which has an OCR option to get it once without having to pay a subscription or any maintenance fees, unlike some other PDF editor that will cost you about $150 per year to use. PDFelement Software is designed to accommodate all platforms and that is why there are a Windows, Mac and iOS versions designed to cater for everyone irrespective of the platform they use. However, this does not stop it from parading some of the best features you can think of. For example, with the PDFelement, you can edit and annotate PDFs. You can remove, add, delete and even rearrange pages of PDF files. In addition, PDFelement allows you make conversions like PDF to Word, PDF to Text, PDF to PowerPoint and even PDF to image. Other features include creating and filling out forms, applying password protection to PDF files, merging and splitting PDF files and much more amazing features. To be specific, the edit function of the PDFelement is the best when compared to other editors. PDFelement Software has continued to evolve for the better and that is why the new version has even come up with better features that are aimed at giving you more value for your money. For example, the new version PDFelement 5.12 now has a redesigned and optimized user interface that is aimed at improving your experience. 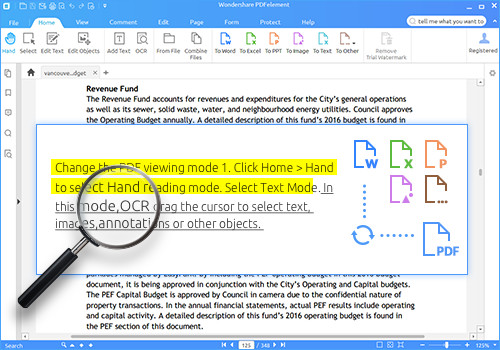 Apart from this, the new version now supports a spelling check in English which comes in handy when you are editing PDFs and many more improvements. As it stands, there is no better way to edit PDFs than the PDFelement and considering that Adobe is much more expensive, it makes sense to conclude this is the most reliable way to edit PDF files.